How freaking good does that look? I have so many recipes for gluten-free pizza crust bookmarked. But the truth is that since even before I stopped eating wheat, I’ve always balked at any recipe containing the words “yeast,” “knead,” or “allow to rise.” I’m not a bread baker. I’m a cake queen, a mistress of vegetables, a goddess of savory dishes from all corners of the globe. I’ve conquered my fear of homemade beans and my pressure cooker paranoia. I’ve learned to ferment my own sauerkraut and kimchi. I’ve even finally managed to remember to defrost the darn stock/beans/etc. ahead of time, at least most of the time. But I’m simply not that interested in learning to make yeast breads. The thing I miss about pizza is the convenience. It’s a magical meal where every part of the meal – starch, veggie, and protein – is stacked neatly together. For a few dollars you can get a slice of this efficient deliciousness just about any time of day or night. It’s tasty as heck, but if I’m going to put in hours of work it’s not going to be for pizza. Well, today I made my first socca pizza for lunch. The whole meal took maybe 30 minutes, tops (which for me is practically an Olympic record), and, unlike some previous weird attempts I’ve made at gluten-free pizza, this actually recreated the experience of pizza. Savory, flavor-packed crust, crisp at the edges and chewy in the middle. Tomato sauce, veggies, and creamy cheese, piled onto a slice that actually survives being lifted and bitten into without flopping down and spilling its toppings hither and yon. Socca pizza is similar to the socca de Nice I’ve made in the past. But instead of using chickpea flour to make crepes on the stove, you bake your chickpea batter in a skillet in a very hot oven. Then you top it with yummy things, run it under the broiler, and pretend you didn’t notice how the recipe said “serves 2 to 3” so you can, with a clear conscience, devour the entire thing. I topped my pizza with marinara sauce from a jar, a sauté of dino kale, red onion, and garlic, and dollops of vegan cream cheese. I left the sauce off of a section of the pizza, and I couldn’t decide which style I preferred. I’d take a bite of one and say to myself, “Oh God, this is the one, no sauce, so crispy and delicious.” And then I’d take a bite of the marinara side and go, “PIZZA! YUM!” and it just went on like that back and forth until the whole thing was gone. This dish was inspired by a post from Celiacs in the House, and adapted from recipes from the blogs A Mingling of Tastes and Simply Sugar & Gluten Free, and The Allergen-Free Baker’s Handbook by Cybele Pascal. Serves 1-2, as a main dish. Put a 12-inch cast iron skillet (10-inch is fine, too, the crust will just be a bit thicker and chewier) into your oven and preheat oven and skillet to 450 F.
In a blender, combine water, chickpea flour, 1 T. olive oil, salt, cumin, rosemary, and oregano. Blend until smooth, scraping sides of blender if necessary. Refrigerate batter until oven has preheated. Remove cast iron skillet from oven. (Careful! It’s very hot!) Put 1 T. olive oil into pan and swirl carefully to coat the bottom and about 1/2 inch up the sides. Return oiled skillet to the oven for a few minutes until oil is hot and shimmering. Remove skillet from oven, pour batter into skillet and place back into oven and cook for 15 – 20 minutes, or until center is set and edges are browned and pull away slightly from the pan. Turn on broiler. Leaving the socca crust in the pan, spread on a layer of tomato sauce (some like it thick, some like it thin). If you are not using marinara sauce, drizzle some good quality olive oil and sprinkle some nice sea salt. Or skip both – it will still be delicious, I promise! 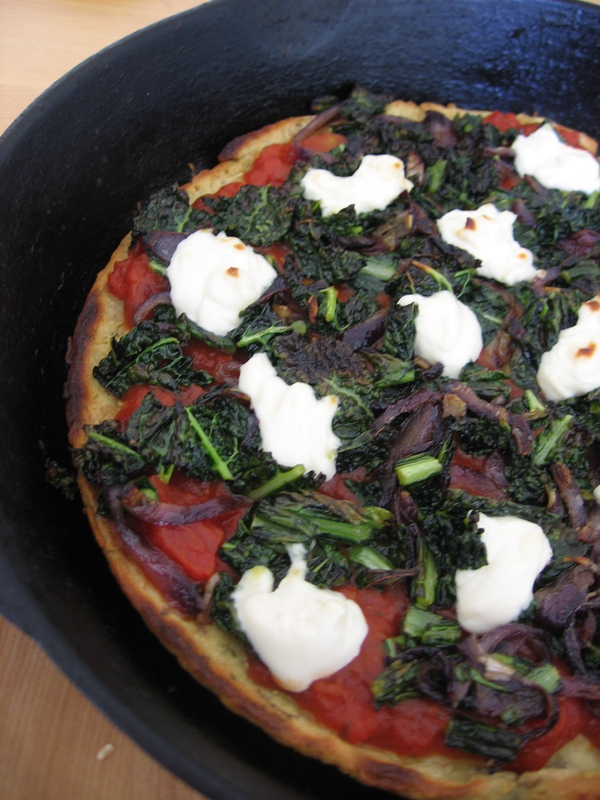 Spread kale topping (see below) evenly across the pizza. Dot with knobs of vegan cream cheese, if using. Place pan under broiler until cream cheese is very lightly browned, being careful not to let the kale burn, about 3 minutes. Remove pan from broiler and let pizza rest for 5 minutes. A steady hand and a spatula will easily slide the pizza from the pan onto a waiting surface, where you can cut it into slices and devour. To make topping: Heat olive oil in a pot or pan and sauté red onion until it begins to brown. Add in garlic and sauté until it begins to brown. Add kale and saute until it reaches your desired texture (some like it al dente, some like it meltingly tender). This entry was posted in Recipes, What I did with my box and tagged garlic, gluten-free, gluten-free baking, kale, red onion, vegan. Thank you! I think you’re a rockstar, too! Curry sauce as pizza sauce sounds AMAZING. Back when I could eat wheat, I used to be addicted to this Indian pizza with cauliflower and curry sauce on it. 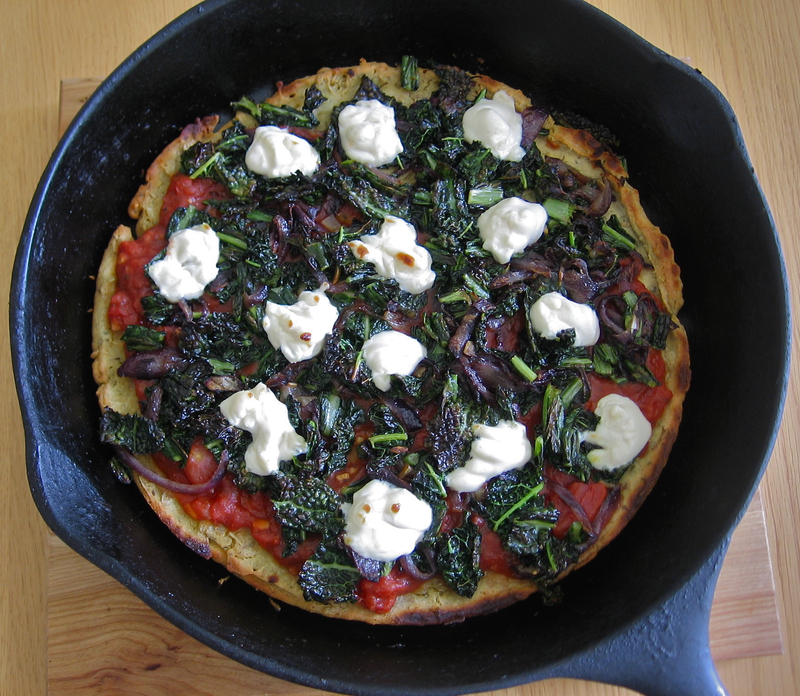 I’m totally salivating right now thinking about recreating it with socca crust. i cannot wait to try your akel & onion socca pizza. i’ve been working on my own xgfx pizza crust for a while, but the finished product takes longer than 30 minutes. a quick ‘n delicious pizza is just what a girl needs when she wants more time to relax and less time spent in the kitchen. yays and yums all around! I can’t wait to see your xgfx pizza crust. I bet it will be fantastique! that pizza looks so amazing! i’ve been looking around for a socca crust that would be quick and easy to make, and lo and behold, you’ve created one! i see this in my tummy in a very short period of time! you rock! Awesome! I’m so glad the timing worked out. You dream of socca pizza, I post about socca pizza, and then socca pizza will be in your tummy! Let me know how it turns out, please, and if you have any notes or edits to the recipe! Your socca pizza looks delicious! I will definitely be making this pizza soon. This looks amazing. this looks incredible! i might have to make this one for a vgfk vlogisode at this point, if ya don’t mind! Please go ahead, that sounds awesome. Spread the vgf love! Very yummy! I used asparagus tips, red onion, and smoked tempeh on mine. I can see myelf making this and changing up the ingredients often. Ooh, that sounds wonderful! I love asparagus on pizza. Socca pizza is pretty addictive, right? I think I am making my 3rd or 4th! We love it. And so easy! Many thanks for this one! A real keeper! This is fantastic to hear! I am so glad you like it and it’s an easy to make recipe. I’ve run out of chickpea flour and I’m going through terrible socca-pizza-withdrawal. Awesome! I made this last night and it was great. Mine shrank away from the edges a good bit in my skillet. I will definitely make it again, and I just might go eat the leftovers for breakfast this morning! I might add some fennel seeds to my crust next time too, cumin + fennel = yum. Or make it just as a bread. I wonder how well it would work as a wrap if I made it thinner? I topped mine with tomato sauce, cheese, TJ’s balsamic roasted onions, sausage and spinach! Yum-O! Oh and one tip, don’t do what I did and lay your fingertip on the cast iron skillet when putting it back in the oven – you will get an instantaneous blister and have an ice cube on your finger for the rest of the day. Ouch! Use a big old oven mitt and not just a potholder when dealing with this super hot skillet! YAY!!! I am so happy you made it and enjoyed it. Your toppings sound super delish as well. I love the fennel seed idea. I will throw some in next time as well. I don’t think that even at its thinnest it would be flexible enough to be a wrap, but if you experiment with that, do let me know how it turns out. I am SO sorry to hear about your finger! Yeah, the skillet and the oil both get super duper hot and always strike me as potential territory for serious disaster. Ugh. Poor Renee! That blister sounds awful. This looks absolutely delicious. I’ve bookmarked it and I’m going to try it out this weekend!! I will try this for my gluten free recipes. Am new at gluten free. Who has an easy recipe for gluten free pie crust? I’ve tried this and it is really good! Is there something about the fava flour that makes this work with just oil and water? Or would it work with other flours too? I’d love to try something that has a little less garbanzo flavor. Though, I am totally going to use this recipe for a falafel pizza sometime with cucumber and tzatiki! Marie, I’m not sure. Chickpea flour is kind of a wonder unto itself, so I don’t know how this would work with a less protein-rich flour. If you try another version, please let me know how it turns out!